There are times when no matter how well you make your plans, life get in the way. So I have been missing for a few days. My project is still layed out and ready when I am. I hope to be back on track very soon. I have gotten a bit side tracked and decided to do some smocking, I am using new(to me) floss. It is a silk floss and has brought it problems with it. I have not made bullion roses with it yet, but will let you all know how that goes. It should be interesting as this thread likes to twist and fray. 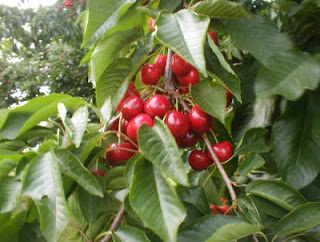 Here are some beautiful cherries for you. A sign of spring and new harvest. we all look forward to new beginnings and that is what spring has always meant to me. I am gathering together the supplies I will need for my next project. I do have an embroidery machine but, the applique on this dress will be done using a regular sewing machine. Yes, you really can applique with a basic sewing machine. Zoe always ask's me "Are those for the hospital babies?" That is the name she has given to the weecare gowns. One of the community projects of the Smocking Arts Guild of America (SAGA), is to provide weecare gowns for babies born to soon or babies that all to soon become angels. Each smocking chapter makes gowns to give to their local hospital. The gowns are then given to the parents of these little ones. At our local hospital a grandma was asked by the family to pick out the gown for the baby. You can imagine how this grandma had looked forward to this baby that sadly would not come home. She was so grateful to be able to do this one little act for her precious grandbaby. Its story's like these that make it easy to set aside some time for sewing and smocking these gowns. Since I like to have a project to work on in the evening, I always try to keep a supply on hand to smock. 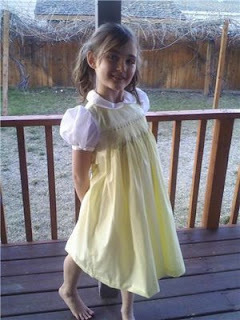 This years Easter dress is from Vogue pattern 7435. It is a basic yoke pattern, with smocking. Incase I haven't told you all yet, smocking is another one of my passions. Welcome to my new blog. I love to sew and I love family, so will be sharing some of both with you.